Enjoying wine - perspectives on wine buying, collecting, tasting, a study in wine marketing & branding; observations, experiences and ruminations of a winegeek & frequent traveler. 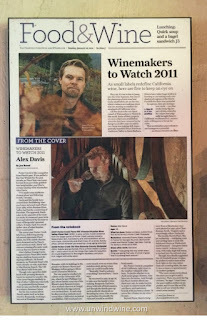 Sharing so others can 'unwindwine' for greater wine discovery, understanding and appreciation. 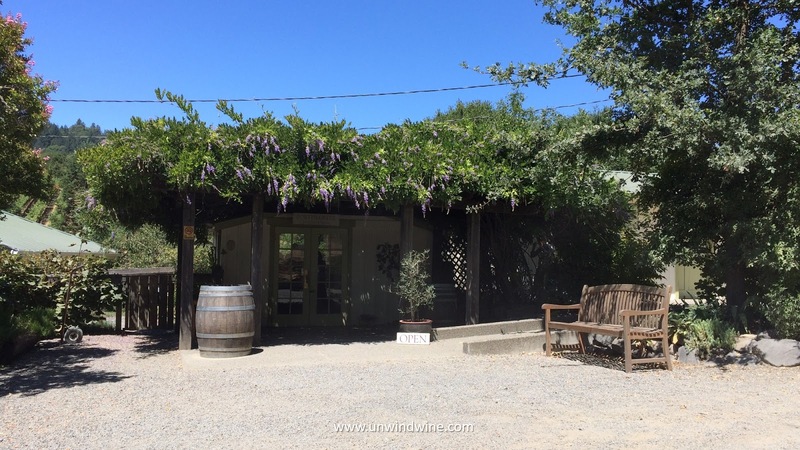 While we focus on targeted producers' select private wine tastings on our wine country trips, one of the greatest joys is discovering a new producer. Typically, these discoveries are smaller producers whose labels are not in wide distribution back in our states. Invariably, they're discovered during a drive by pop in visit which we allow for once or maybe twice per day. In retrospect, these often turn out to be highlights of the trip, and become sources for small boutique wines that we continue to collect going forward. Its a double edged sword serving and sharing undiscovered 'no-name' producers' labels with friends. While its fun to experience a new undiscovered wine, its dauntingly tempting serving a wine that is not available to acquire after discovery. While, one may not run out to the local wine shop to pick up a couple bottles, in the modern era, almost all producers are available and can be acquired on-line, (unless you're in one of the few states that prohibit importing wine into their bounds (such as Indiana)). 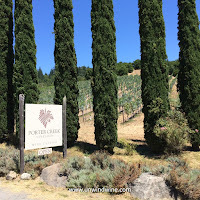 So it was, on our just completed 'Pour Boys' Sonoma/NapaValley Wine Experience that we came upon Porter Creek Vineyards and Winery during our recent drive through the Sonoma County and the Russian River Valley. 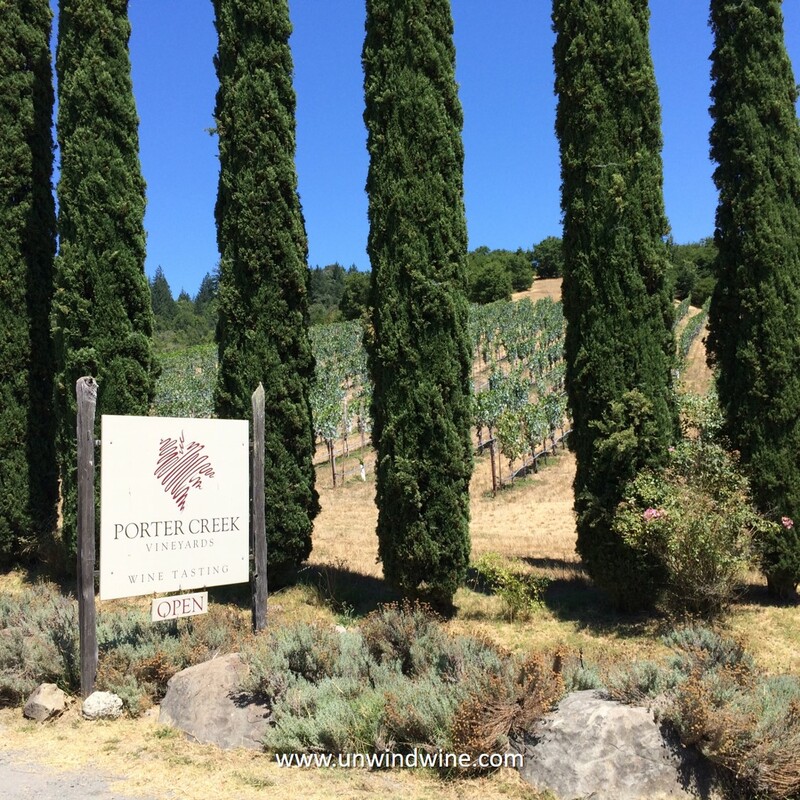 Porter Creek is a small father-son operation run by George and Alex Davis, named for the Porter Creek tributary that runs down to the Russian River. They focus on organic hillside grown, single vineyard designate wines from varietals from Burgundy and the Rhone, those best suited to the terrior of the Russian River Valley, Chardonnay, Pinot Noir, Syrah, and Viognier. 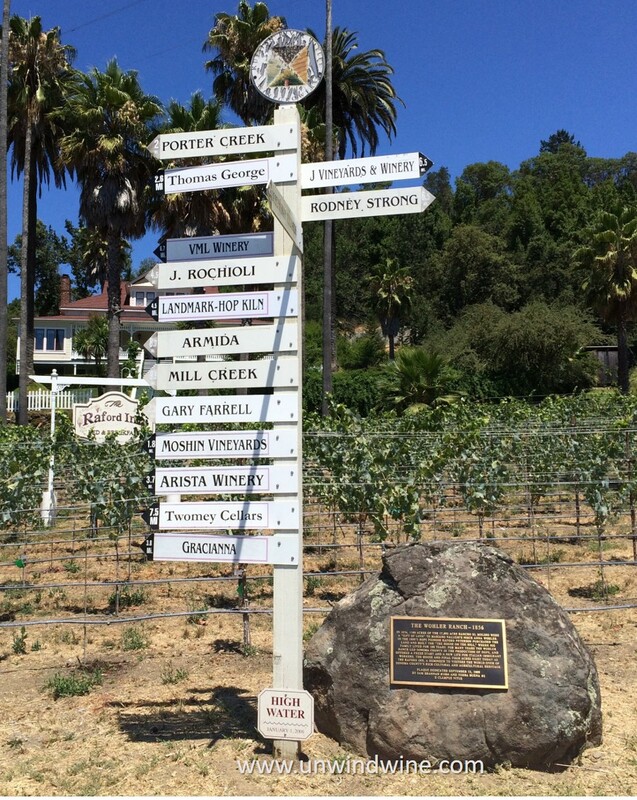 They also produce an estate Zinfandel and a Carignane sourced from Mendocino. 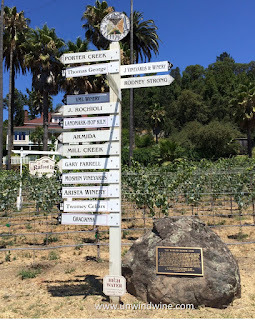 big-name branded labels from Napa producers which are sourced from the same appellations and terroir. Of course, many factors go into making wine, yield and viticulture, the wine making and blending, but small producers who exercise the same care and controls, can produce equally compelling wines as the premium labels. 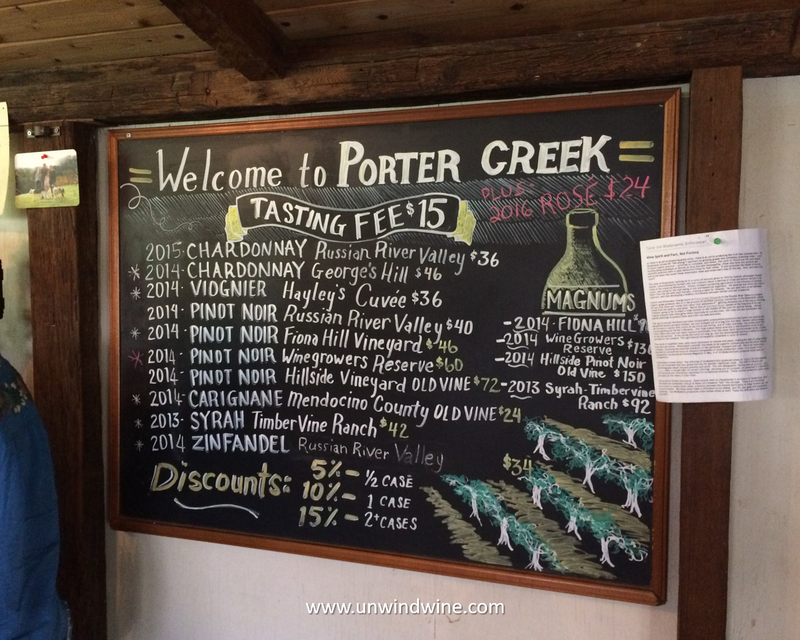 Under the direction of owner/winemaker Alex Davis, Potter Creek strives to produce quality wines creatively and reasonably so as to maintain high QPR affordability. Porter Creek is as unpretentious as could be in their historic one room tasting hut built with hand made redwood beams, decorated with local artwork, with its colorful sweet scented wisteria covered trellis, up the gravel road, nestled between the cottage farm house and a free range egg chicken coop. The Davis family acquired the Healdsburg estate and vineyards in the 1970's which already had vines on the property that were planted in the 'Old Vine Block' as early as 1974. They were early pioneers when they started producing Russian River Valley Pinot Noir in 1982, made still today in the old world classic Burgundian style. 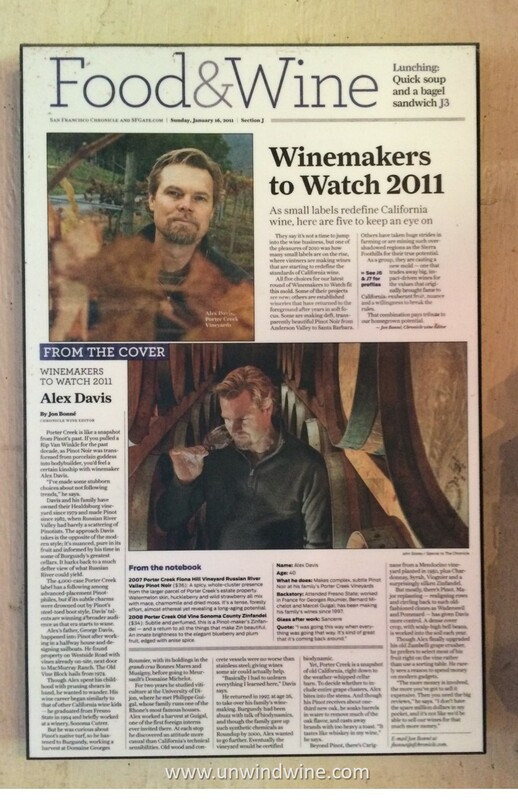 Alex Davis was featured in the San Francisco Chronicle "Porter Creek's Alex Davis: Winemaker to watch in a 2011" in their WINEMAKERS TO WATCH 2011, by Jon Bonné, Chronicle Wine Editor in January of that year. 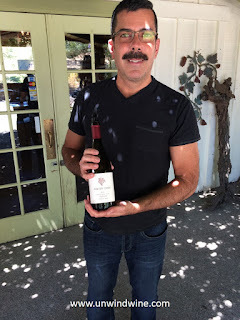 Alex spent his childhood in the vineyards and wine barn, earned a degree in Enology at Fresno U., and after college worked at producer Sonoma Cutrer. His wine education for Pinot Noir was cast when he went to the home of Pinot, Burgundy in France, and worked the harvest at famous properties Domaine Georges Roumier, with its holdings in the grands crus Bonnes Mares and Musigny, and then spent time at Meursault's Domaine Michelot. He studied viticulture at the University of Dijon for two years, where he met Philippe Guigal, of the legendary Rhone producer. Alex was one of the first foreign interns to ever work a harvest at Guigal. He returned to California in 1997 to take over as winemaker of the family business at age 26. Porter Creek sources fruit from their own vineyards and a couple neighboring growers - the vineyards forming a crescent around the wine estate property. 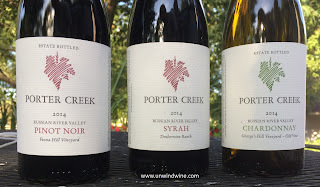 Today, Davis focuses on the Porter Creek signature Estate Pinot Noir, and Chardonnay, but he also produces some Rhone varietals, Syrah, Viognier and a Carignane sourced from a Mendocino vineyard planted in 1950. 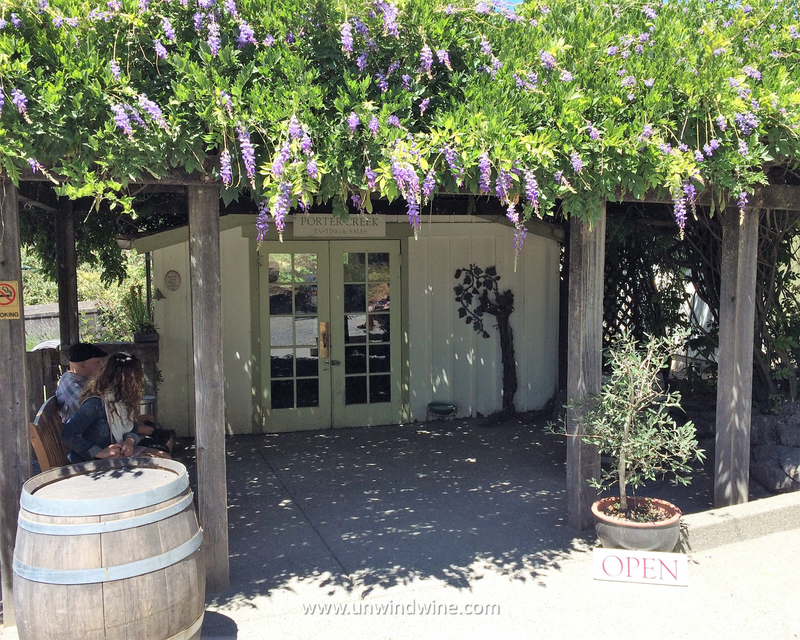 He also produces a Zinfandel that is sourced from the vineyard just across the road. On our chance drive by pop in visit we were hosted by Jonathan Demichael, Tasting Room Manager (left). The tasting room was full of revelers and we almost moved on but Jonathan persisted and served us on the picturesque patio under the pleasant perfume of the wisteria covered trellis. After initial introductions and overview of the property and wine selections, we learned Jonathan, a musician before turning Sommelier, was a fellow Hoosier and still had ties back to IU and Bloomington. 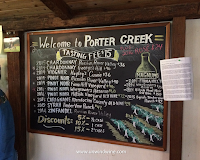 We stayed on and explored the Porter Creek portfolio and had a wonderful relaxing visit. We ended up acquiring several cases and are eager to re-visit and share our discovery back home. Winemaker's Notes: In the spirit of its northern Rhone counterparts in Condrieu, this wine possesses a weight and richness rarely found in New World Viogniers. Beautiful nuances of mango, pear and nectar. Balanced, round and capable of aging. 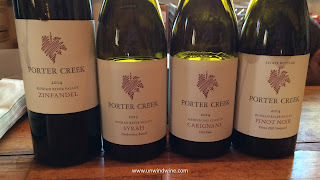 Highlights of the tasting for me were the Chardonnay, Pinot and the Syrah, (shown left) of which we acquired a mixed case with Dr Dan, who also acquired cases including some of the Viognier and the Carignane. 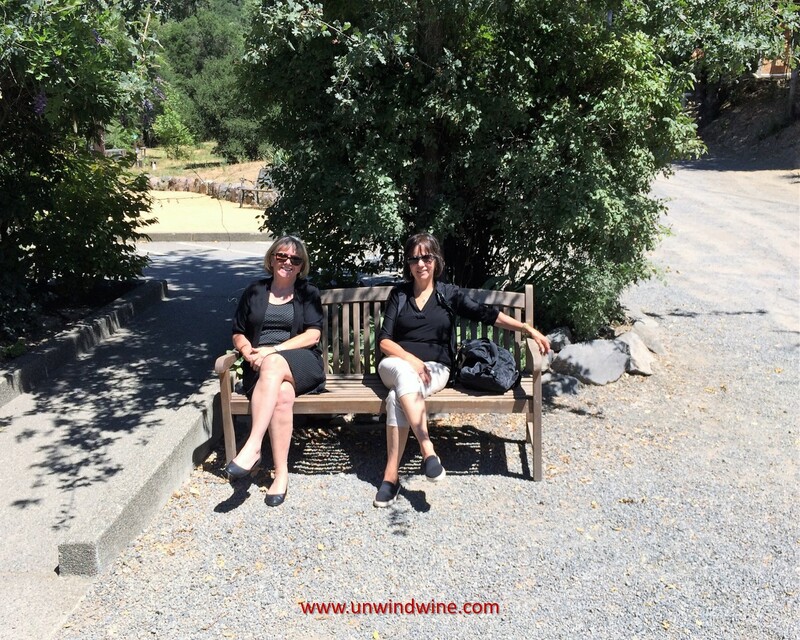 Rick McNees, wine collector, wine writer and reviewer, publishes this blog and Rick's WineSite™ unwindWine™ - a useful wine portal for wine enthusiasts from the neophyte to the master. Recognized and noted by Wine Spectator, Food & Wine Magazines, and The Chelsea Daily, the site features Rick's personal wine blog journal and reviews, wine travels & events, wine book, label and link libraries, wine wav files, and a user forum.